You just never know what pattern is going to sweep through the knitting blogs like wildfire. The first in my experience was the Clapotis. I knit two of those. Then there were Jaywalkers. 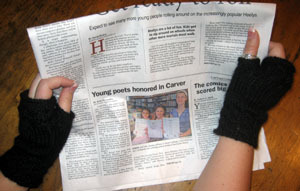 I knit two pairs of those. And now there’s Fetching. It took me a while but I finally hopped on that bandwagon. 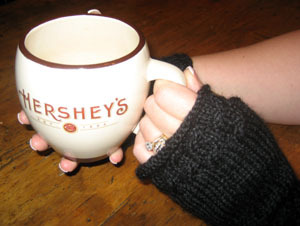 I had a skein of Classic Elite Wings in jet black that was just crying out to be knit into these mitts. 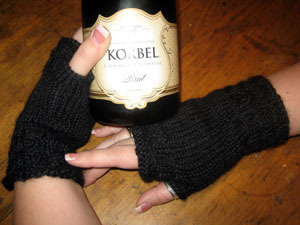 They were my last finished knit of ’06 and I wore them on New Year’s Eve when we headed out for the night. But you know when they came in most handy? New Year’s Day. Something about the name just really worked for me. Honey, fetch me some coffee. And could you fetch me the paper, too? How about fetching me some champagne, too? See what I’m talking about? I’m just not sure Dale is as fond of them as I am. Heh. The gloves are nice, though. How was the knit? Fast? Annoying? Fun?